Starlog was a monthly science fiction magazine created in 1976. Here is a collection of these publications lovingly scanned in PDF format on DVD rom. Starlog Photo Guidebook - Fantastic 3-D (1982). Starlog Photo Guidebook - Science Fiction Weapons Vol 1. STARLOG magazine. Starlog was a monthly science fiction magazine that was created in 1976. Issues 1- 265 of. Lovingly scanned in PDF format on 2 x DVDs. The magazine examined the form of science fiction and used interviews and features with artists and writers as its foundation. Silveracre has been dealing in the very finest comics and collectibles since 1988. It will normally be fine if we are notified in advance. We have been trading for over 25 years, and pride ourselves on our knowledgability, professionalism and friendliness. Silveracre has been dealing in the very finest comics and collectibles since 1988. Add us to yourfavourites list. Don't worry, we will always get to you! It will normally be fine if we are notified in advance. Starlog was a monthly science-fiction film magazine published by Starlog Group Inc. They got their start in publishing creating a soap opera magazine. STARLOG 5 DVDs Sci-Fi Science Fiction Magazines Star Trek . Silveracre has been dealing in the very finest comics and collectibles since 1988. Don't worry, we will always get to you! It will normally be fine if we are notified in advance. We accept all major credit cards. Silveracre has been dealing in the very finest comics and collectibles since 1988. Don't worry, we will always get to you! DEBIT/SWITCH CARD We accept all major credit cards. CREDIT CARD Add us to yourfavourites list. Its first issue hit stands in August 1976, and it kicked off with a complete guide to the episodes of Star Trek: The Original Series and a behind the scenes look at The Bionic Woman. 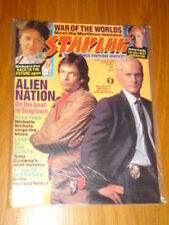 Starlog focused on science fiction and was released on a regular basis until 2009. Silveracre has been dealing in the very finest comics and collectibles since 1988. Don't worry, we will always get to you! It will normally be fine if we are notified in advance. CREDIT CARD DEBIT/SWITCH CARD. Silveracre has been dealing in the very finest comics and collectibles since 1988. We have been trading for over 25 years, and pride ourselves on our knowledgability, professionalism and friendliness. Starlog Magazine Joblot x 4. Number 157 August 1990- In very good condition. Number 172 November 1991- In very good condition. Silveracre has been dealing in the very finest comics and collectibles since 1988. CREDIT CARD It will normally be fine if we are notified in advance. Add us to yourfavourites list. Silveracre has been dealing in the very finest comics and collectibles since 1988. Don't worry, we will always get to you! We accept all major credit cards. We accept Debit/Switch cards. DEBIT/SWITCH CARD. Silveracre has been dealing in the very finest comics and collectibles since 1988. Don't worry, we will always get to you! We accept all major credit cards. It will normally be fine if we are notified in advance. Starlog was a monthly science-fiction film magazine published by Starlog Group Inc. They got their start in publishing creating a soap opera magazine. STARLOG 5 DVDs Sci-Fi Science Fiction Mag on DVD Star Trek . Silveracre has been dealing in the very finest comics and collectibles since 1988. Don't worry, we will always get to you! Add us to yourfavourites list. We accept all major credit cards. It will normally be fine if we are notified in advance. Silveracre has been dealing in the very finest comics and collectibles since 1988. Don't worry, we will always get to you! Add us to yourfavourites list. Silveracre has been dealing in the very finest comics and collectibles since 1988. Don't worry, we will always get to you! It will normally be fine if we are notified in advance. We accept Debit/Switch cards. Silveracre has been dealing in the very finest comics and collectibles since 1988. Don't worry, we will always get to you! We accept all major credit cards. We have been trading for over 25 years, and pride ourselves on our knowledgability, professionalism and friendliness. Silveracre has been dealing in the very finest comics and collectibles since 1988. Don't worry, we will always get to you! PO Box 114. We accept all major credit cards. DEBIT/SWITCH CARD CREDIT CARD. Silveracre has been dealing in the very finest comics and collectibles since 1988. It will normally be fine if we are notified in advance. Don't worry, we will always get to you! Starlog magazine..the making of robocop dolph lundgren, etc . Silveracre has been dealing in the very finest comics and collectibles since 1988. Don't worry, we will always get to you! It will normally be fine if we are notified in advance. Add us to yourfavourites list. Silveracre has been dealing in the very finest comics and collectibles since 1988. It will normally be fine if we are notified in advance. Don't worry, we will always get to you! Add us to yourfavourites list. Australia and rest of the world outside. Overseas (i.e. outside the. ). Starlog was a monthly science-fiction film magazine published by Starlog Group Inc. They got their start in publishing creating a soap opera magazine. 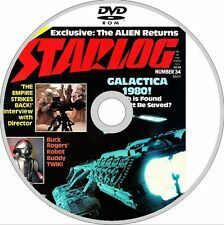 STARLOG 5 DVDs Sci-Fi Science Fiction Magazine. Silveracre has been dealing in the very finest comics and collectibles since 1988. Don't worry, we will always get to you! We have been trading for over 25 years, and pride ourselves on our knowledgability, professionalism and friendliness. Starlog CineMagic Special Effects Moviemaking Magazine. CineMagic The Guide To Fantastic Filmmaking. 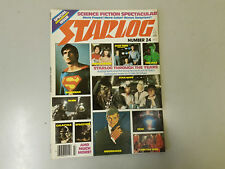 STARLOG #67 SCI-FI MAGAZINE FEBRUARY 1983 SUPERMAN III STAR TREK SPOCK E.T. Silveracre has been dealing in the very finest comics and collectibles since 1988. Don't worry, we will always get to you! It will normally be fine if we are notified in advance. We have been trading for over 25 years, and pride ourselves on our knowledgability, professionalism and friendliness. Don't worry, we will always get to you! Silveracre has been dealing in the very finest comics and collectibles since 1988. We have been trading for over 25 years, and pride ourselves on our knowledgability, professionalism and friendliness. Silveracre has been dealing in the very finest comics and collectibles since 1988. Add us to yourfavourites list. It will normally be fine if we are notified in advance. We have been trading for over 25 years, and pride ourselves on our knowledgability, professionalism and friendliness. Starlog was a monthly science fiction magazine that was created in 1976 and focuséd primarily on Star Trek at its inception. Kerry O’Quinn and Norman Jacobs were its creators and it was published by Starlog Group, Inc. in August 1976.